So, who's a Coke (Coca-Cola) fan?? I am!! I know a lot of you are too and so its a pleasure for me to bring to you some wonderful and fun news. Cool down with Coca-Cola this summer with their 125th year anniversary celebrations! Coca-Cola has created a summer-long program, available through My Coke Rewards. If you haven't used or heard of My Coke Rewards before, its a program where you enter in pins from 15 different Coca-Cola brands to get points. Then you use those points for entering sweepstakes, winning instant win prizes, supporting good causes such as donating to your child's school, etc. I personally love these games in My Coke Rewards, especially when they're the board game type. This time, it's an interactive summer treasure map! It's easy enough and if you're drinking coke anyways, why not take a couple more steps and win some prizes while you're at it! If you are not yet a Coke Rewards member, simply log onto www.mycokerewards.com and follow the instructions to register. There's not much time left so get on it now! 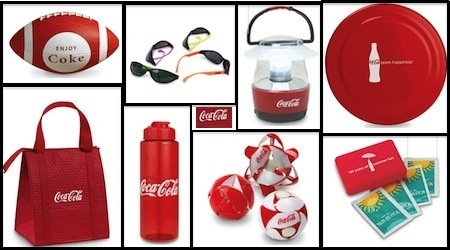 As part of the 125 year celebrations, Coca-Cola is offering a Park Kit to one of Whirlwind of Surprises' readers. 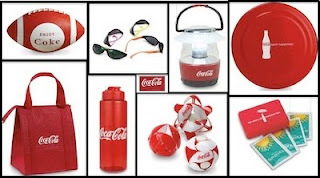 It consists of everything you need for a fun day outdoors: a football, frisbee, reversible ball, sunblock kit, sports water bottle, and sunglasses, as well as a LED light for when you want to stay out a little longer and a Coca-Cola tote to store your goodies in. Enter here. I love mycokerewards, and I pay my 12 year old a few dollars a month to type in all the bottle cap codes. I love MyCokeRewards, I just scored a free 10 pack of Minute Maid juice boxes last week! I love MyCokeRewards. I have cashed out for lots of great things! I love my coke rewards! We haven't cashed in for a prize yet...we are saving for something big. Love mycokerewards!! My hubby drinks his body weight in diet coke everyday, so we sure do rack up points!!! Great review! I love all the Coke merchandise, woohoo!! My co-worker uses this program. I heard it is a great program. I have been entering sweepstakes on Coke Rewards for a while, still waiting for the big win! I love products and companies that 'pay me back' for my purchase. If I'm gonna buy them anyway, it's awesome that I might get some reward for it! I love the products and coke well Diet coke is one of my loves :). I love the rewards program also. My son would love that football! I love COKE products. I actually collect them! I have never used My Coke Rewards, will have to check into that. My Coke rewards hasn't seen me in a while...lol, I should probably make a visit. Thanks for the reminder!